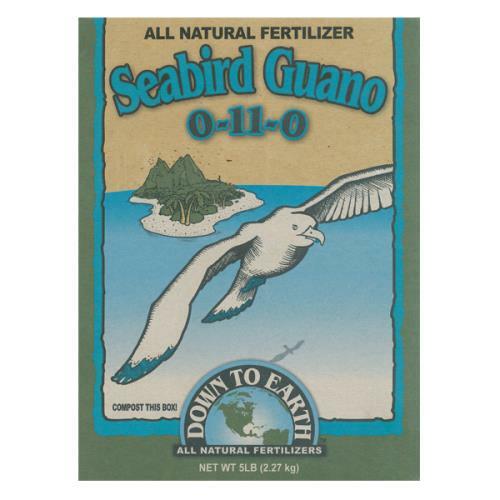 Use high-phosphorus Down To Earth™ Seabird 0-11-0 guano throughout the flowering period for all indoor and outdoor plants. Strawberries, melons, vegetables and all types of flowers will benefit from mid-season applications to improve yields, quality and flavor while also enhancing the beneficial bacteria activity in your garden soil. DTE™ Seabird 0-11-0 guano can be mixed into garden soils and potting mediums or applied as a side dress throughout the growing season. Use our high phosphorous Seabird Guano to dramatically increase both the amount and size of blooms throughout the flowering period for all indoor and outdoor plants. Seabird Guano greatly enhances beneficial bacterial activity in the soil and because it’s water soluble, it makes an excellent tea or foliar spray when filtered.